have saved money using Entertainment coupon books for over 50 years with discounts on restaurants, local attractions, groceries, travel and more. With 126 local editions, Entertainment coupon books cover every major city throughout North America. 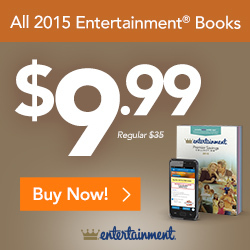 Entertainment coupon books make great gifts for dads and grads (or anyone else).